Rosie Warby, pictured with her husband, David, who has lived at Kalkee Community, Nangatta since 2013. Rosie praised the residence for its high-quality care, the one-on-one time staff spend with residents and the support it provides families. Uniting AgeWell’s Kalkee Community, Nangatta, provides dementia-specific, high-level aged care at Belmont. With experienced and specially trained staff and a holistic approach to resident wellbeing, the home’s quality of care gives families peace of mind. Senior care manager Glenda Harvey says all care staff undertake training through Dementia Support Australia, Swinburne University and Uniting AgeWell’s own programs. 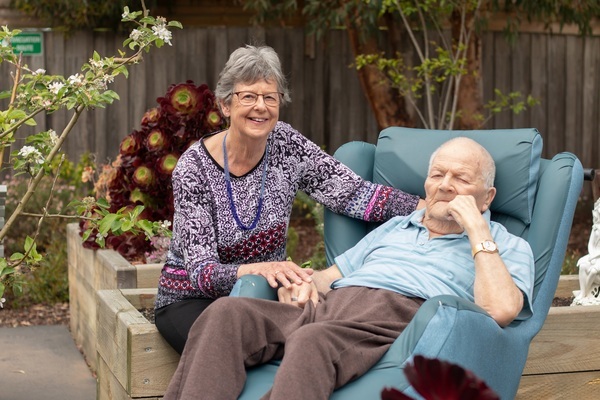 “All our nurses and personal care workers have a greater understanding of dementia’s effects and how to deliver high-quality and tailored care while honouring the resident,” Glenda said. The staff’s specialist knowledge enables Kalkee Nangatta’s team to develop detailed and unique lifestyle and care plans for residents. “We’re constantly looking for signs of unmet needs,” Glenda says. “Feeling unwell or overly tired, excessive noise and even the colour of decor can add to confusion in people with dementia. “A commonly missed event is pain, which may not present the same way for people with dementia. To address this we continually look for changes in eating patterns, loss of appetite, a refusal to participate or being unsettled. Importantly, Kalkee Nangatta operates a versatile, extended daily lifestyle program for residents to engage in meaningful and enjoyable regular activities including intergenerational visits with the local day-care group, five bus outings weekly, family events, pet therapy and cooking classes. Along with its homely atmosphere, stunning sensory gardens and welcoming, qualified staff, residents also have access to physiotherapy, podiatry, speech therapy, dietetics, dedicated general practitioners and ready support from Dementia Support Australia. For more information about Kalkee Community Nangatta or to book a tour phone 5243 6688.